Last night when I was just about to ready to fall asleep, I had an idea. That’s the way ideas usually happen. The next morning you wake up with a nagging empty feeling, that you’ve maybe lost something, but can’t quite put your finger on what’s missing. This time was different. The idea was so profound and exciting, that I couldn’t afford to forget it. I didn’t write it down either, but anyhow, when I got up in the morning I still had it in my mind clear as yesterday. What if I could tickle and trigger the Arpeggio Trig -inputs on my Korg Mono/Poly and Polysix with just programmed loud audio signals from my midi sequencer? It’s not exactly a groundbreaking idea, it’s been done before, but to me it was something exciting, somethingI had never tried before. My idea was to have just a pulsing rhyhtm fed into the trig in jack that would sync the arpeggios to my midi gear. I knew beforehand, that some people had used their samplers with a certain non musical sample to trigger external equipment, but I had something else in mind. My Akai MPC 2000XL is the tool that I mostly like to use for sequencing, but as I only have the regular stereo-outputs in it and no extra outs, I couldn’t use those because that would’ve ment the loss of drumtrack. 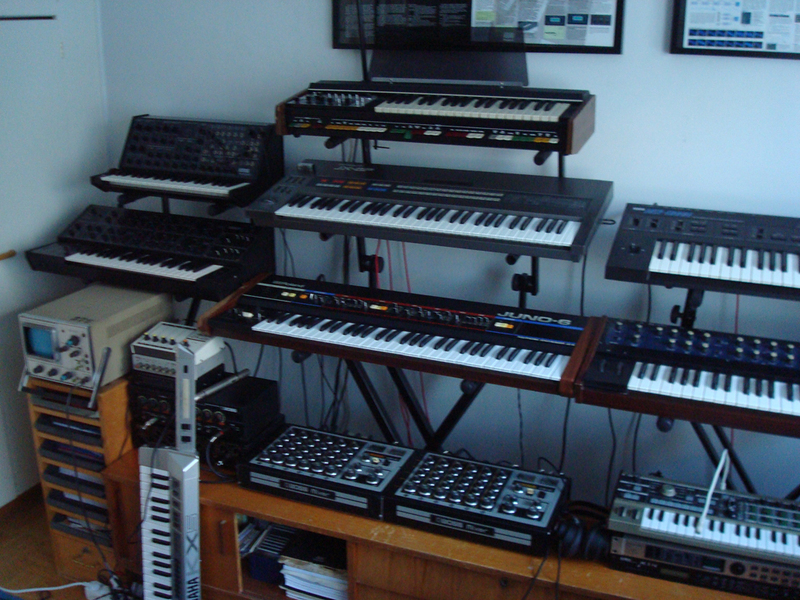 Next to my MPC there’s a Kawai K1 RII rack unit, that I rarely use for anything. It has 4 outputs in addition to it’s regular stereo-pair. So I decided to use this 90’s Kawai racksynth as a midi to trig -converter. I loaded a drum program and a midi sequence into my MPC, programmed a repeating note on a free midi channel for the duration of the whole 4 beats, fired up the Kawai, put a cable from output 2 into Mono/Poly’s Trig In and then Arpeggio Trig In. No effect, either way. Or at least not the desirable effect. The Mono/Poly started warbling when I flicked the trig polarity switch, but no rhythmic patterns were to be heard anywhere. I was dissapointed and decided that the problem was with the type of sound I had chosen. I went through all the presets and ended up using a basic loud synth sound with fast attack. I programmed the sound to have no sustain or release and step by step went through the sequence shortening the decay of every note to 5 and turning up the velocity to 127. Still no luck. I tried many things, but eventually gave up. Just when I was ready to turn off the power and forget the whole thing I had the bright idea of routing the signal through my Korg MS-20’s External Signal Processor. With that I finally had success. I adjusted the volume and threshold knobs to get an even pulse, patched the ESP’s trig out into Mono/Poly’s Arpeggio Trig In and from Mono/Poly’s trig out into Polysix’s Arpeggio Trig in. Finally I patched the ESP’s Envelope Out to MS-20’s own trig in and there I had it. I had my midi-sequencer controlling not only numerous midi equipment, but also three non-midi synths and everything was perfectly in sync. I didn’t need control voltage as all I wanted to do was to sync the two arpeggios to my drums and other sequences going on. I’ve been pining for a Roland TR-707 lately, but with this newfound innovation, I’m in no hurry. It’s not perfect, it’s not beautiful, it’s not meant to be, but it works. That’s all that matters in the end. I finally have my CV/Gate synths happily in sync with my midi synths and sampled drums. As I was testing this configuration I already made one krautish new track. Perfect. (link is on the web site). Since I developed the synth, please feel free to ask questions.